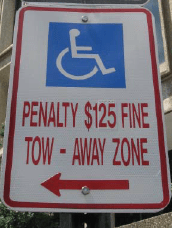 Each year, the City of Roanoke writes approximately 450 citations for violations of disabled parking regulations (also referred to as “handicapped parking”). Many of these citations could have been avoided by simply knowing more about the applicable parking guidelines and taking steps to comply with them. It is our hope that this information will help your next parking experience in Roanoke to be a positive one. If your vehicle has a disabled parking license plate, or a properly displayed disabled parking placard, you may park in a designated disabled space for an unlimited amount of time. If your vehicle has a disabled parking license plate or a properly displayed disabled parking placard, you may park in a timed space (2-hour, 1-hour, etc..) for up to four (4) hours. For example, you could park for 4 hours in a spot where the sign reads “30-minute parking.” There is an exception for parking in the meter pilot zones. When parking at a meter monitored street, those with disabled plates and placards must register at the meter to receive one hour free and obtain a receipt. Payment will need to be made for additional time at the meter. It is never allowed to park in a loading zone, in front of a fire hydrant or in a fire lane or where it says “No Parking.” Such zones are off limits at all times. Due to the seriousness of violations of disabled parking, warning citations are never issued for violations such as these. Here is a Disabled Parking Brochure with information on properly displaying a placard. Did you know?…. Disabled drivers with a valid placard or license plate may park at any daily space in PARK Roanoke garages and receive the first hour of parking for free until 4:00 p.m. Monday through Friday. Disabled parking placards must be displayed from the rear view mirror of the vehicle (not on the dashboard) with the permit number facing the street. Patrol vehicles must be able to see the placard from both the front and rear of the vehicle. For greater privacy, masking the driver information on the reverse side of the placard is allowed. It is important that all drivers understand that no placard should be left hanging from the rear view mirror while the vehicle is in motion. 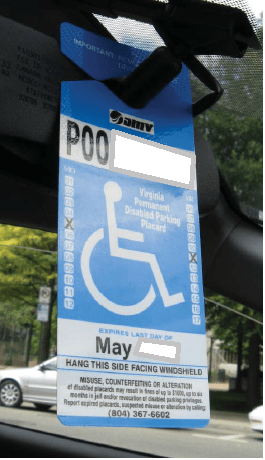 Both the Code of Virginia, the Code of the City of Roanoke, and the DMV regulations state that the placard must be hung from the rear view mirror.